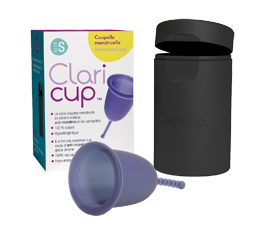 Claricup claims to be the only menstrual cup made of medical grade silicone that is anti-microbial. In addition, the cup comes with a steralization container and instructions for cleaning the cup in the microwave. This cup should be very easy to clean. Produced in France by Claripharm Laboratoire, they are uniquely devoted to making the highest quality products for use in your body and produced in compliance wit the relevant French regulatory requirements and they are seeking ISO13485 certification.